1990, 1991, 1993a,b) have led some investigators to conclude that micro-momyid and paromomyid plesiadapiforms were mitten-gliders (Beard, 1993b) and shared a closer relationship to extant flying lemurs (classified together in Eudermoptera; Beard, 1993a,b) than Euprimates (Beard, 1989, 1993a,b; Kay et al., 1990, 1992). Despite the fact that this "mitten-gliding hypothesis," as well as the character support for Eudermoptera, have been strongly challenged in the past 15 years (Bloch and Boyer 2002a,b; Bloch and Silcox, 2001, 2006; Bloch et al., 2001, 2002b; Boyer and Bloch, 2002a,b; Boyer et al., 2001; Hamrick et al., 1999; Krause, 1991; Runestad and Ruff, 1995; Sargis, 2002c; Silcox, 2001, 2003; Stafford and Thorington, 1998; Szalay and Lucas, 1993, 1996), a plesiadapiform-dermopteran relationship has gained currency (e.g., McKenna and Bell, 1997). In contrast, based on a wealth of new postcranial data, we have demonstrated that: (1) no plesiadapiform yet studied shows morphological characteristics reflective of dermopteran-like mitten-gliding (Bloch and Boyer, 2002a,b; Bloch et al., in review; Boyer et al., 2001); (2) many aspects of the generalized plesiadapiform postcranium indicate committed arboreality possibly homologous to that of Ptilocercus, which suggests that features related to such a lifestyle, previously thought to uniquely link flying lemurs and paro-momyids are, instead, reflective of the primitive condition for Euarchonta (Bloch and Boyer, 2002a,b; Bloch et al., 2001, 2002b, 2003, in review; Boyer and Bloch, 2002a,b; Boyer et al., 2001; Sargis, 2001a,b, 2002a,b,c; Szalay and Lucas, 1993, 1996); and (3) cladistic analyses suggest that some of the more specialized arboreal adaptations of certain plesiadapoid plesiadapiforms (specifically Carpolestidae) are uniquely shared with Euprimates, indicating a closer relationship between these two groups than previously supposed (Bloch and Boyer, 2002a, 2003; Bloch et al., 2002b, in review). Figure 8. (A) Hypothesis of phylogenetic relationships among archontans that is well supported by dental, cranial, and postcranial evidence presented elsewhere (Silcox, 2001). 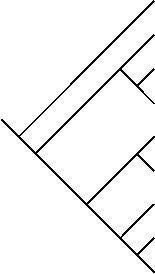 (B) Hypothesis of phylogenetic relationships among select archontans illustrating phylogenetic position of Carpolestidae based on cladistic analysis of 65 postcranial characters (figure from Bloch and Boyer, 2002a; Figure 1). Note that both topologies support a plesiadapiform-euprimate link, while the cladogram based on new postcranial data presented in Bloch and Boyer (2002a) specifically allies Carpolestidae with Euprimates (Omomyidae + Adapidae). group to Euprimates to the exclusion of all other included mammals (Figure 8A). Bloch and Boyer (2002a) presented a cladistic analysis of the new post-cranial data discussed here. The results of their postcranial analysis are consistent with those of Silcox (2001) in supporting a plesiadapiform-euprimate relationship but, unlike those of Silcox (2001), they suggest that Carpolestidae falls out with Euprimates to the exclusion of other plesiadapiforms (Figure 8B). Analyses that combine new dental, cranial, and postcranial data from these two analyses, as well as that from the work of Sargis (2001b, 2002a,b,c, also this volume), are underway (Bloch et al., in review; but see Bloch and Boyer, 2003; Bloch et al., 2002b). Preliminary results of this project indicate that plesiadapoid plesiadapiforms (including Carpolestidae, Plesiadapidae, Saxonellidae, and Asian Chronolestes simul; Silcox, 2001) form a mono-phyletic clade that is the sister group to Euprimates to the exclusion of all other fossil and living euarchontan mammals (Bloch et al., in review). This hypothesis of relationships, coupled with new functional interpretations of plesiadapiform skeletons, provides a more resolved picture of the sequence of character acquisitions in early primate evolution than was previously possible through analyses of fragmentary postcrania (e.g., Beard, 1991a, 1993a,b; Szalay and Dagosto, 1980) or through indirect means, such as comparative studies of extant mammals (Cartmill, 1972, 1974; Rasmussen, 1990). Both arboreal tree shrews (Sargis, 2001a) and didelphid marsupials (Lemelin, 1999) have been presented as living ecological models for plesi-adapiforms and the ancestral euprimate, respectively. It is plausible that the earliest primates were capable of grasping in a manner similar to living arboreal tree shrews like Ptilocercus (Sargis, 2001a, 2002b,c; Szalay and Dagosto, 1988), and in that regard are perhaps best represented in the known postcranial fossil record by micromomyids and paromomyids. The specialized eupri-mate foot, which includes a divergent and opposable hallux with a nail (see Dagosto, 1988), likely evolved next in a form similar to that of Carpolestes, independent of leaping or orbital convergence. This stage of primate evolution might be best modeled by arboreal delphids like Caluromys among living mammals (Lemelin, 1999; Rasmussen, 1990). We acknowledge that plesiadapiform taxa currently known from post-cranial material are dentally relatively derived (see Kirk et al., 2003) and are unlikely to represent direct ancestors along a lineage leading to the first euprimates. However, this type of evidence is usually lacking in the fossil record. If paleontologists were to restrict themselves to studying only those species that were plausibly directly ancestral in their studies of the stem lineages of major clades, then we would know very little about the early evolution of, for example, either Hominini (i.e., australopiths) or Cetacea (i.e., archaeocetes). As is the case for these stem taxa and the origin of humans and whales, respectively, we are confident that analyses of plesiadapiform primate skeletons provide useful data in evaluating the competing adaptive scenarios of euprimate origins (Bloch and Boyer, 2003). At least three possibilities exist concerning the nature of the postcranial similarities between plesiadapiforms and euprimates: (1) plesiadapiforms and euprimates do not share a recent common ancestry, and all of their uniquely shared postcranial similarities are the result of convergence; (2) plesiadapi-forms and euprimates do share a recent common ancestry, but all of their uniquely shared postcranial similarities are the result of parallel evolution; or (3) some, or all, of the uniquely shared postcranial similarities are synapo-morphies of a clade that either includes carpolestids and euprimates (as suggested by cladistic analysis of only postcranial data; Bloch and Boyer, 2002a), or all plesiadapoid plesiadapiforms (including carpolestids) and euprimates (as suggested by cladistic analysis of dental, cranial, and postcranial data; Bloch and Boyer, 2003; Bloch et al., 2002b, in review). Evidence for and against each of these explanations is outlined below. It has been suggested that any unique characteristics shared by plesiadapi-forms and euprimates must be the result of convergence because the two groups do not share a recent common ancestry (Kay and Cartmill, 1977; Martin, 1990). Evidence for (or against) this interpretation stems from phy-logenetic analyses that do not (or do, respectively) support a monophyletic plesiadapiform-euprimate clade. Results of recent phylogenetic analyses unambiguously support a monophyletic plesiadapiform-euprimate clade, based on a larger sample of taxa with more complete morphologic data than ever before analyzed (e.g., Bloch and Boyer, 2003; Bloch et al., 2002b, in review; Silcox, 2001), although these results are not without controversy (Bloch et al., 2003; Kirk et al., 2003). Regardless, there is at least consensus in the literature that plesiadapiforms are euarchontans, and as such, are closer to the origin of euprimates in phylogenetic space and time than are didelphid marsupials (Lemelin, 1999) and arboreal rodents (Kirk et al., 2003) and would be better ecological models and have at least as much, if not more, bearing on the competing adaptive scenarios for euprimate origins as these groups do. In a similar but not equivalent argument, it is possible that unique similarities between plesiadapiforms and euprimates could have been acquired in parallel from a relatively recent common ancestor (Bloch and Boyer, 2002a, 2003; Kirk et al., 2003). We emphasize that it is implicitly acknowledged in this explanation that plesiadapiforms share a relatively recent common ancestry with euprimates and is thus in broad agreement with recently published phylogenetic hypotheses (Bloch and Boyer, 2003; Bloch et al., 2002b, in review; Silcox, 2001). The most convincing evidence for a "parallel evolution" explanation is that large-bodied plesiadapids, which might share a sister-relationship with carpolestids, lack some of the unique euprimate characters. If Plesiadapis represents the primitive condition for Plesiadapoidea, then these characters (e.g., specialized opposable hallux with a nail) would have evolved in parallel. Alternatively, it could be argued that large-bodied species of Plesiadapis are derived, and that more primitive, and therefore more phylo-genetically relevant, plesiadapids, such as Nannodectes (Beard, 1989, 1990), might share more in common with carpolestids than previously recognized. Thus, it is plausible that the primitive plesiadapoid condition is more closely represented by Carpolestes (Bloch and Boyer, 2002a) than by Plesiadapis (Kirk et al., 2003). However, even if grasping did evolve in parallel from the common ancestor of plesiadapoids and Euprimates, it would represent an example of the parallel evolution of a strikingly euprimate-like mammal from the same arboreal ancestor in potentially identical ecological conditions, and would still be very relevant for assessing hypotheses of euprimate origins (Bloch and Boyer, 2003). Such a scenario would require the common ancestor of euprimates and plesiadapoids to have differed from other euarchontans in having more bunodont teeth and better grasping capabilities. 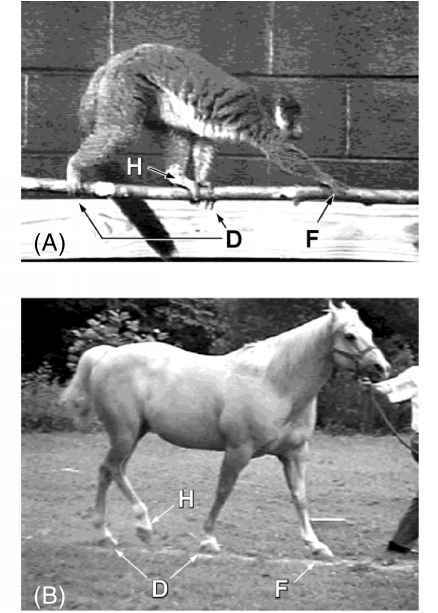 Both of these features are consistent with increased frugivory (Szalay, 1968) and locomotion in terminal branches. In the subsequent hypothetical parallel radiations of euprimates and plesiadapiforms, both could plausibly have evolved more specialized grasping independently, but in similar ways for similar reasons. It is also plausible, although no direct evidence supports it yet, that the first euprimates could have then co-opted this initial adaptation to terminal branch frugivory for visually directed predation (Bloch and Boyer, 2003; Ravosa and Savakova, 2004). On the other hand, direct fossil evidence does support the hypothesis that this initial adaptation was co-opted for grasp leaping locomotion in the earliest euprimates (Szalay and Lucas, 1996). The last argument, and the one preferred here, is that the uniquely shared characteristics of plesiadapoids and euprimates were inherited from a relatively recent common ancestor (Bloch and Boyer, 2003). Arguments against this interpretation are the same as those listed as evidence supporting the convergent and parallel evolution hypothesis outlined above. Furthermore, evidence for this interpretation is the same as that used in the arguments against these two hypotheses: phylogenetic hypotheses that entertain a monophyletic plesi-adapoid-euprimate clade (e.g., Bloch and Boyer, 2003; Bloch et al., in review) have greater explanatory power in the face of all of the known dental, cranial, and postcranial data than those based on partitioned data sets (Beard, 1993; Bloch and Boyer, 2002a; Bloch and Silcox, 2006; Kay et al., 1992). If one accepts the hypothesis that Plesiadapoidea are the sister clade to Euprimates, then Euprimates must have originated by around 64 MYA as indicated by the earliest occurrence of a plesiadapoid plesiadapiform (Pandemonium; Van Valen, 1994). In this case the first 9 MY of euprimate evolution remains unknown. In this scenario, acquisition of specialized grasping features for terminal branch locomotion would have preceded the evolution of visual specializations in stem-primates and would thus not be considered a specific adaptation for nocturnal, visual predation. In the words of M. Cartmill (1992: 111) "[w]e can only hope that new fossil finds will help us to tease apart the various strands of the primate story, giving us clearer insights into the evolutionary causes behind the origin of the primate order to which we belong." Older and more primitive skeletons of plesiadapiforms are needed to test our ideas about the evolution of euprimate-like grasping (Bloch and Boyer, 2002a). Likewise, more complete postcranial fossils of the earliest euprimates, and a better sampling of the Paleocene fossil record of Africa, Asia, and the Indian subcontinent, are needed to address how euprimate-like leaping and forward facing orbits might have evolved from a terminal branch-foraging ancestor.